So it looks like the listing has ended... I've updated the link with the next cheapest alternative, £37.85 from basecomshop (before using discount code). Cheapest price I've seen for this so far, original price is £36.95 before using eBay code "PERKS" for 10% discount. Should I get into the Dragon Quest universe? Deffo! No better way to start than with this one to be fair. You don't need to play them in order as each game has a separate plotline and different characters, but as they always say, it helps! 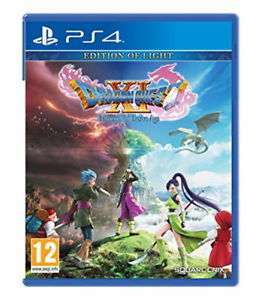 Anyone that's played this know how it compares to DQ8? Anywhere near the same level? Anyone that's played this know how it compares to DQ8? Anywhere near the …Anyone that's played this know how it compares to DQ8? Anywhere near the same level? Reviews all say it’s a great return to the core series too. I’m enjoying it! Got this on PC and it is great. Fantastic game, really polished. It's up there with 8 yeah, not sure anyones as good as Yangus, but time will tell. Sold by base not game collection so I assume it's expired ? "The listing you're looking for has ended.... We found something similar"
Yeah. I'm not getting from them. Are there any other games similar to Ni No Kuni and Dragon Quest that are due to be released on consoles soon? The music is downgraded (midi) and has put me off getting it on PS4, hopefully someone can create a mod for the symphonic compositions and put them in on the pc version. The music is downgraded (midi) and has put me off getting it on PS4, …The music is downgraded (midi) and has put me off getting it on PS4, hopefully someone can create a mod for the symphonic compositions and put them in on the pc version. I'd say best way to play it currently is through a PS2 emulator, can upscale it to HD then too. You're right... Thanks for the heads up - I've updated with the next cheapest alternative. DQ8 is one of my all time favourites! So far it’s the same quality, I can r …DQ8 is one of my all time favourites! So far it’s the same quality, I can really see myself getting into it if I had more time. Then Spider-Man came along too...Reviews all say it’s a great return to the core series too. I’m enjoying it! Dug in about two hours before Spiderman got here. Gonna restart the game with the higher enemy difficulty option cause it was a tad easy. Dug in about two hours before Spiderman got here. Gonna restart the game …Dug in about two hours before Spiderman got here. Gonna restart the game with the higher enemy difficulty option cause it was a tad easy. Yeah that’s true! Maybe there’s a difficulty curve soon. I’m only a couple hours in too. Really really wanted to like this game. The music is awful. Keyboards! Surely this game needs sweeping orchestras not a Casio keyboard. After playing 20+ hours I couldn't stand listening to the music anymore. I played on and eventually just stopped and asked "why am I playing still"
I'm sure people will love the game and it will be perfect for them. I dunno if i will like this game so i'm waiting until it goes below 30 pounds. I really liked Persona 5. Yeah that’s true! Maybe there’s a difficulty curve soon. I’m only a couple …Yeah that’s true! Maybe there’s a difficulty curve soon. I’m only a couple hours in too. 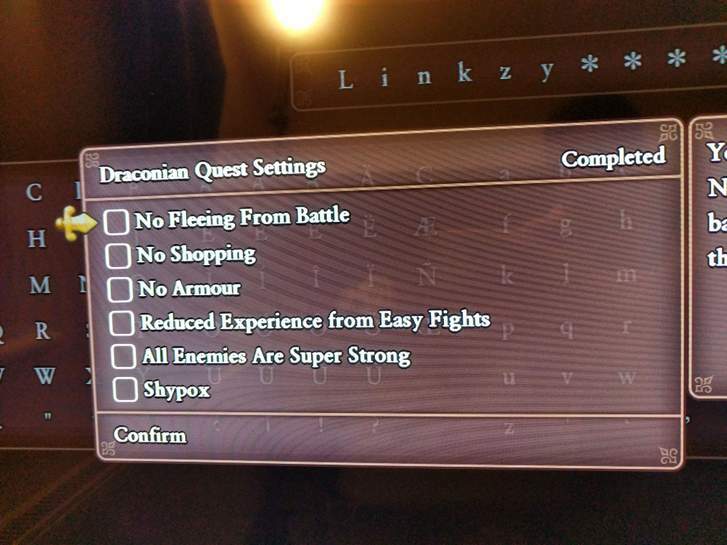 @Burneout‌ @sukhdev92 So my copy arrived today, and I noticed in both yours guys comments you mentioned about the difficulty of the game (or lack of it) - Just noticed that when you first create an adventure log, you get an option called "Draconian Quest", which allows you to make certain tweaks to increase the difficulty. Just pointing this out in case you do feel you need a challenge!